We received an e-mail from an employee of Stagecoach, the company responsible for the majority of London buses. Our contact works a route roughly one mile from the site of the bus bombing last Thursday. The bus driver pointed out that the number 30 bus was the only one to be re-routed after the initial bombs went off in the London Underground, every other bus carried on its normal journey, but for some reason this bus was diverted. The driver notes the following about CCTV maintenance. "CCTV gets maintained at least 2 or 3 times a week and can digitally store up to 2 whole weeks worth of footage. this is done by a private contractor....So when I heard that the CCTV wasn't working on a vehicle that's no more than 2 years old since last June.....I'm sorry that's rubbish, I work for the company I know different." Drivers in the depot already think the so called bombers had inside help because it was to organized. Some even think it had help from the company." I have received other information suggesting that the CCTV is regularly maintained and checked. The police pay the bus company to check it, and the bus company makes a substantial profit out of this, so all parties benefit from keeping the CCTV systems working. This information makes it all the more suspicious that the bus cameras were not working. Was the mammoth 20 hour inspection session of the CCTV a means of disabling the CCTV, or something even darker? 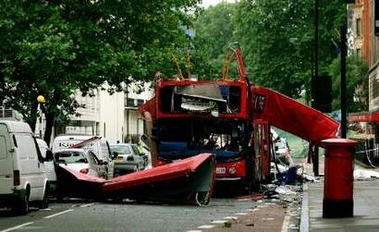 Were the contractors, who were not familiar to the bus company employees, actually placing the bomb? But don't worry, the media are drooling over this picture of supposed suicide bomber Hasib Hussain, who we are told detonated the bus bomb. Well, it's a grainy picture of a Muslim guy with a rucksack, case closed! That's good enough evidence for me, I'm going back to sleep.